One of the quick additions that I had planned is adding a winch to the rear of the mill. 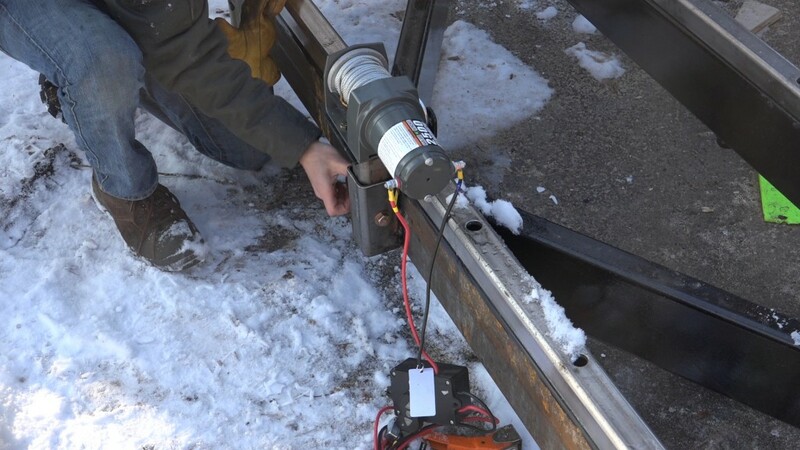 This will make log handling much easier. In the future I can run the cable off to the middle of the bed to roll logs onto the bed but right now, I have logs stacked all over and most of them will need to be pulled across the bed instead of being rolled onto it. A popular request was to replace the hand crank on the feed winch with a drill so I’ll be trying that out as well. 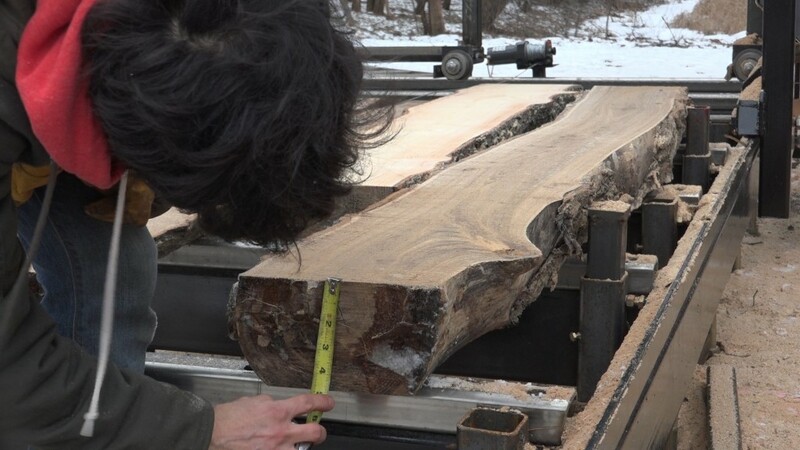 The first log is a section of elm with a small crotch on one end. I added an indicator to the log scale so I can easily see where the blade is off of the bed and I can also scale 4/4 boards. 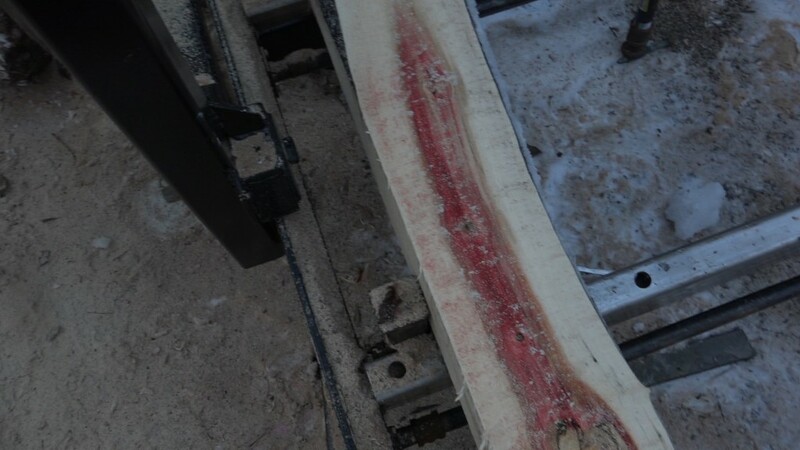 For this elm log, I cut flats on three sides and then sliced single live edge boards out of the cant. Next up was a small spruce log and it was at this point that I started having issues with my temporary tensioner for the height adjust. 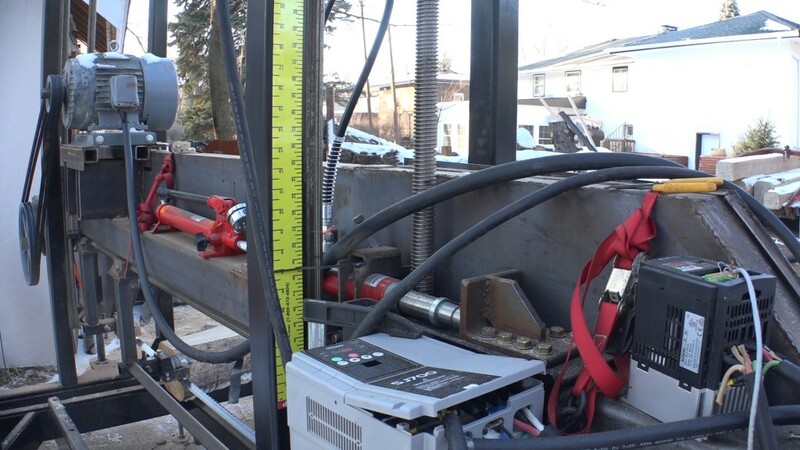 The clamps that were holding the idle sprockets would slip so only one side of the saw head would move. Each time this happened, it threw off the saw’s parallelism. I also had issues with the set screws that grab the acme rods slipping. This would have the same affect on the parallelism of the saw head. 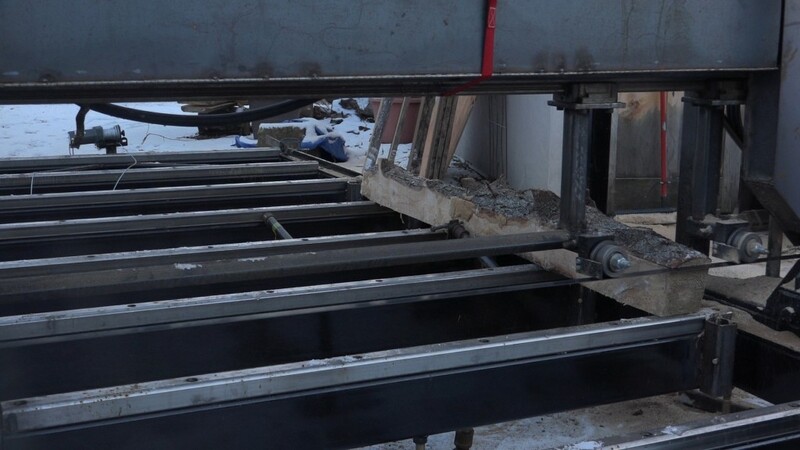 I changed the way my temporary tension idlers were configured and was able to continue sawing. I squared the spruce log up into a 5×5. 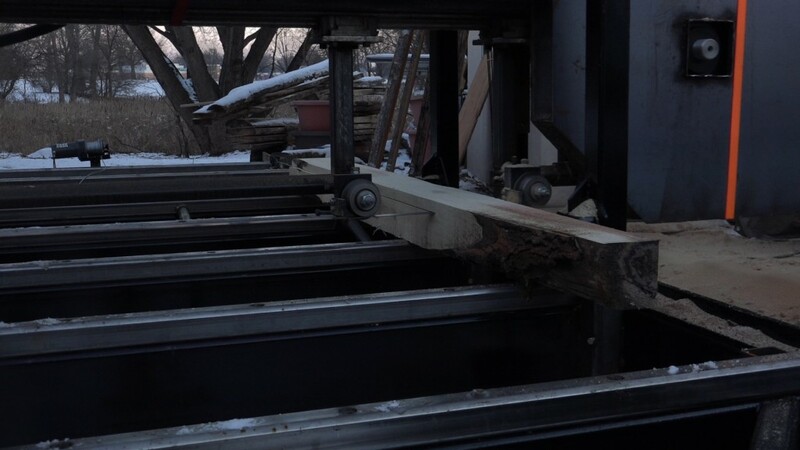 Having some beams will be helpful in the future for log handling. 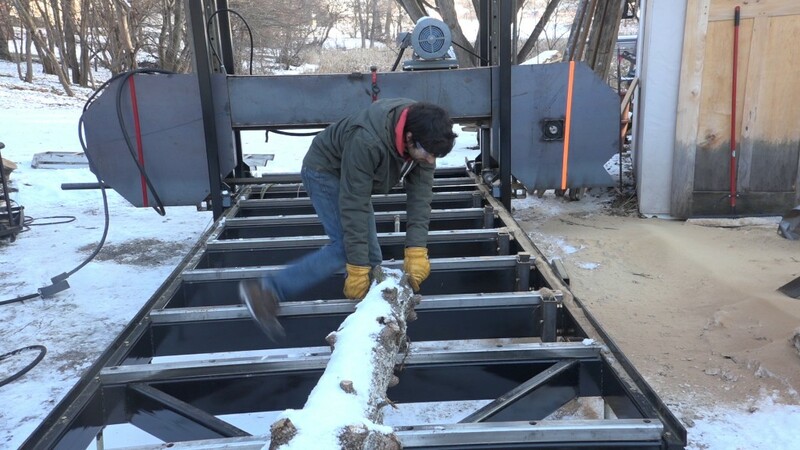 Next I went after a small box elder log which was frozen to the other logs. A good wack with a chuck of wood breaks it free. This log had some really nice flame in it. 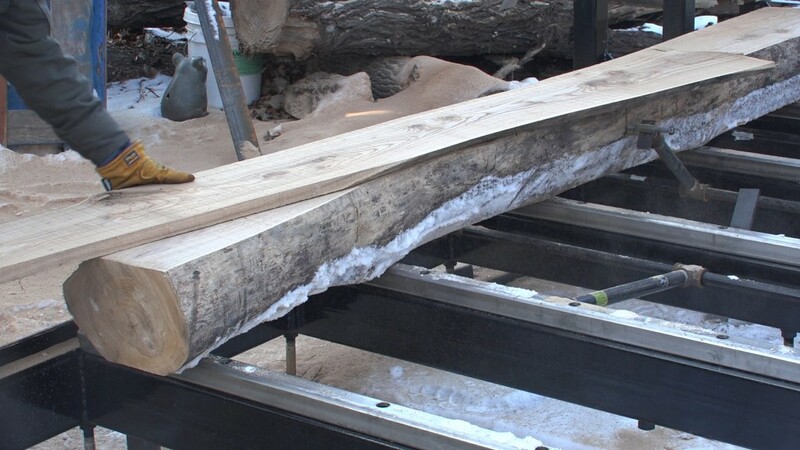 I used the 4/4 scale to slice this log up into boards. I also had this goofy piece of elm. I cut a flat on one side and then rolled it to cut a parallel flat on the other. I tried to aim for the second cut hitting the bottom of the void. I continued cutting that log up into live edge 4/4 boards. The next day I had some more free time so I started by trying something many people suggested: cutting two logs at the same time. I had two thoughts about this. 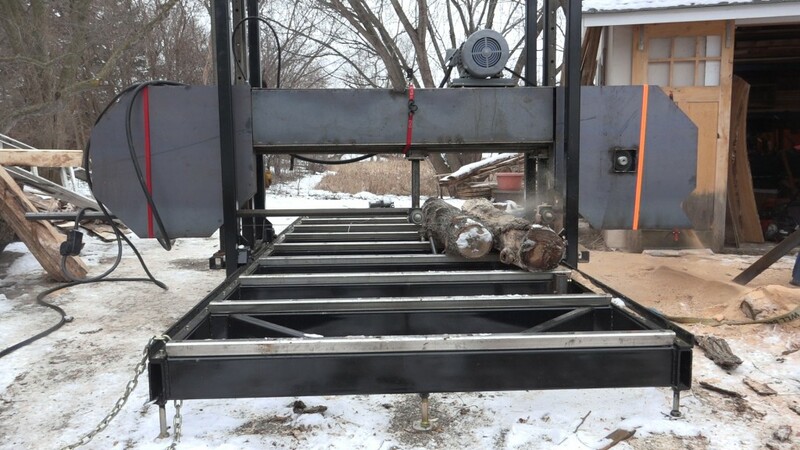 First, the logs should be very close to the same diameter otherwise you would end up having more waste on the larger log as you try to bring the small one into a cant. 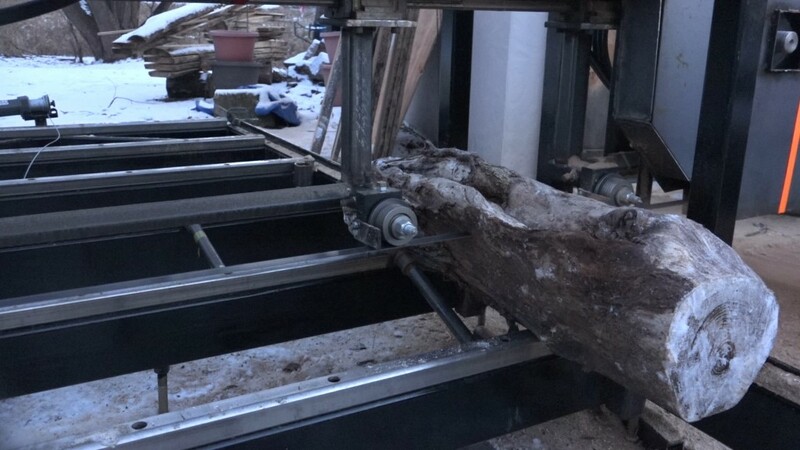 The other thought was more of a concern over the effectiveness of clamping the logs against one another since the logs are not going to be perfectly consistent and could slip around during the cut. 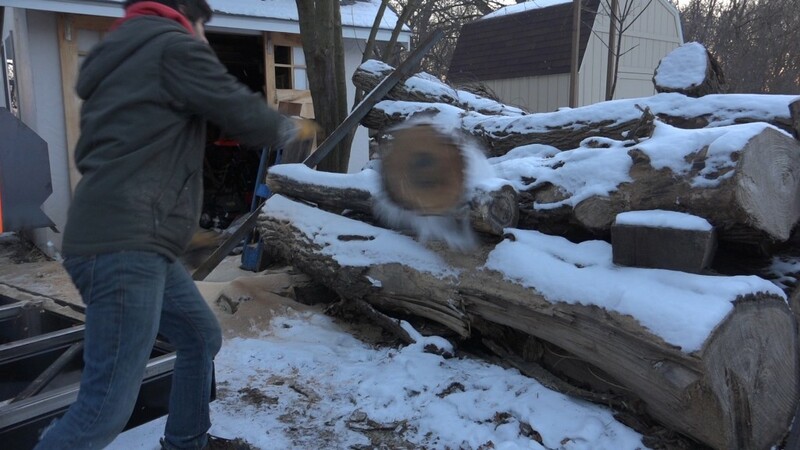 Here I’m cutting a 10″ diameter log and a 12″ diameter log. I made one cut on the 12″ log before adding the 10″ log. 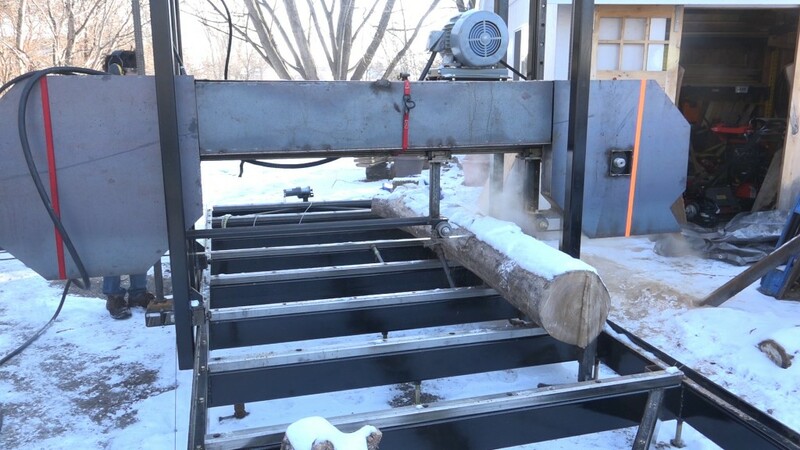 Seem above is the second cut on the 10″ log and the third cut on the 12″ log (producing a board). 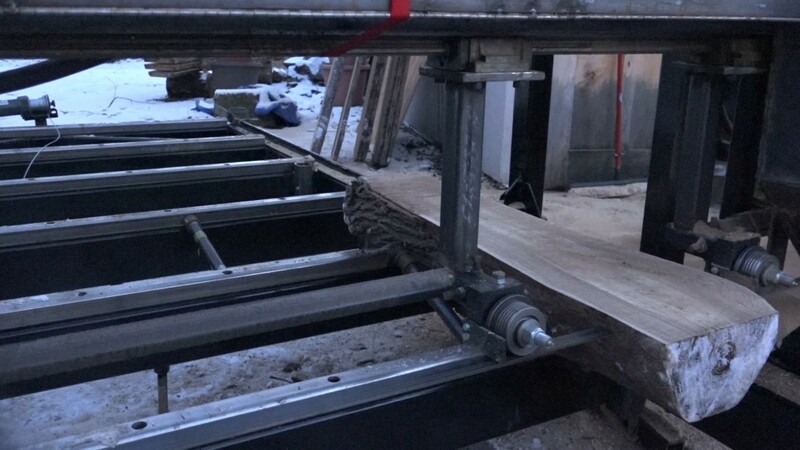 This does work alright although I’m not sure how well clamping more than two logs together would go. 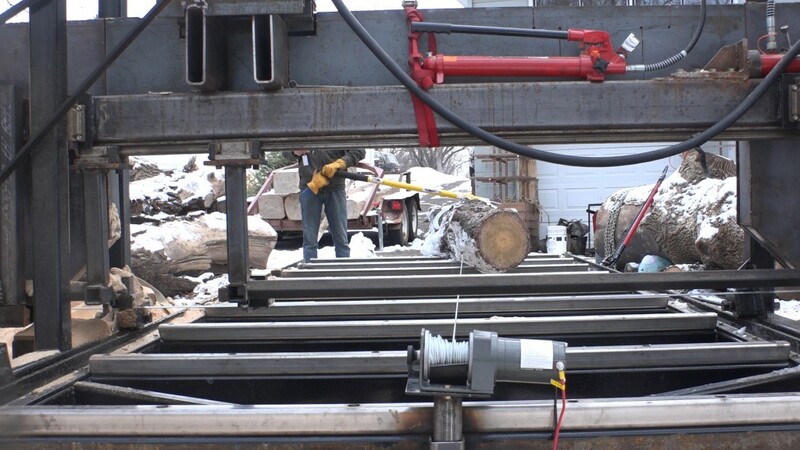 This process would be much easier if the logs were squared into cants first. I made one cut at 8/4 and that put me pretty close to the pith. To avoid having the pit in the middle of my next 8/4 board, I cut a 4/4 board which put the pith in or close to the saw kerf. 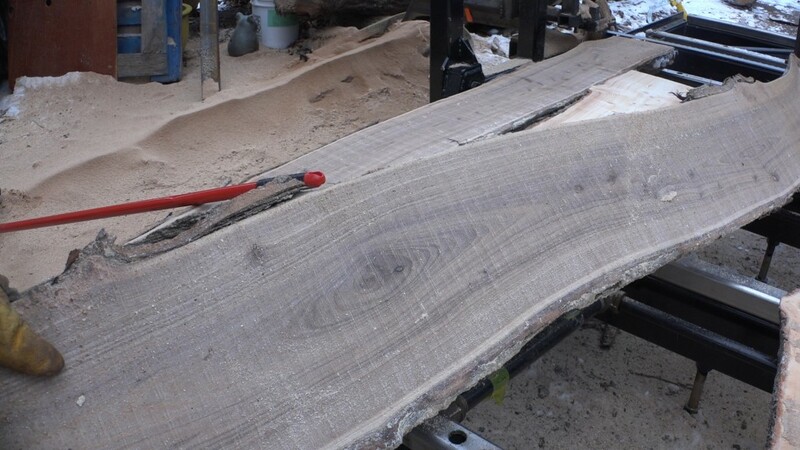 I’m not sure what kind of elm this is but it looks almost exactly like walnut when freshly sawn. 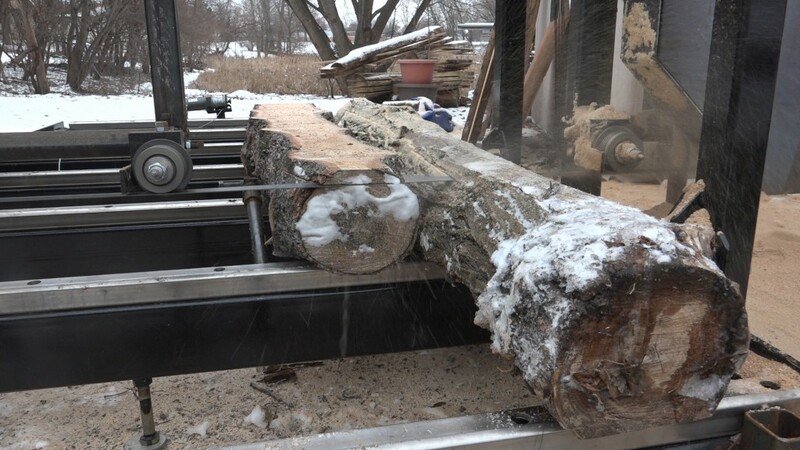 Before calling it a day, I loaded the next log onto the mill for the next time I decide to use the mill. Taking a look at some of the boards. 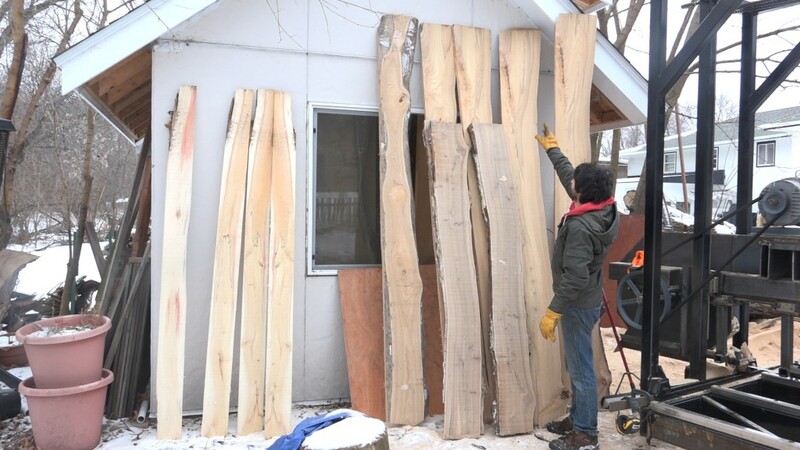 The box elder on the left, the tall boards on the right are the first elm log, and the shorter ones are the other elm log that looked like walnut.